Unter den Linden: Memory Lane or Path to the Future? News flash: Berlin is old. The famous TV Tower and World Clock of Alexanderplatz. Though far from being the oldest city in Europe (or in Germany, for that matter), this capital still has nearly eight hundred years under its belt. And after standing as one of Germany’s most important cities through all of those centuries, it’s no surprise that some of that history is still clearly visible for those who know how to look. Some of it is spelled out through architecture. There are the museums on the aptly named Museum Island, home to Berlin’s ancestor city of Cölln (not to be confused with Köln, aka Cologne); the oft redesigned city center, Alexanderplatz; and of course, one of Germany’s most famous landmarks, the Brandenburg Gate — which is itself the entry to an equally historic street, Unter den Linden. 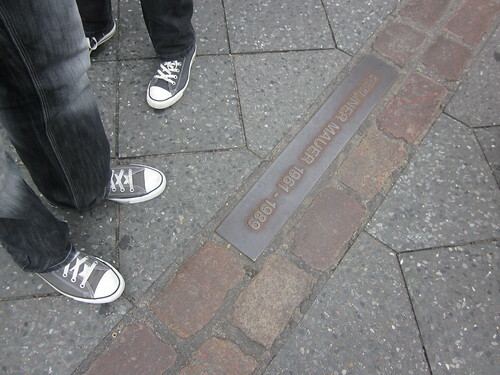 The Berlin Wall was unable to escape Berlin’s obsession with street plaques. There are also the intentional nods to Berlin’s history, whether it’s the numerous Holocaust memorials, the brick path tracing the location of the Berlin Wall, or the survival of the iconic East Berlin Ampelmann in all of his various forms. Finally, there are the specific reminders from World War II. Even today, seventy years after the fact, many of the cities older buildings are riddled with bullet holes, or bear larger scars from grenades and bomb strikes. Some of the lesser damage remains untouched as a rough, bullet-riddled facade. In other places, bright new brick, half-finished detailing, and poorly disguised plaster patch-ups stand as stark reminders. And in yet others, Berliners have apparently decided their city is best repaired with Legos. But even when surrounded by so much of it, are today’s Berliners actually that focused on history? With it’s status as “the most hipster city in Europe,” plus its vivid nightlife and a strong Jugendkultur (youth culture), the answer appears to be no. In fact, as is the case across the country, most Germans are more interested in the reality of today than they are with the bullet holes of yesterday. It’s a subject that doesn’t appear often in the media — and that lack of media representation is telling enough by itself. When Berlin’s architectural history does appear on the newsreel, it seems to be more focused on opposition to modern reconstruction of war damage. Reports from Der Spiegel, for example, admittedly describe a populace who are concerned with losing the history, but simply because reconstruction is expensive, disruptive, and in many cases, not really all that necessary anyway. Even the city of Berlin itself describes itself as an entity which is mostly viewed as having combined the old with the new, with very little time for reminiscing on history. With today’s political and economic environment, Berlin in particular has bigger things for its media culture to focus on. Instead, the city has become a European landmark whose citizens walk among reminders of their past, while keeping their eyes firmly fixed on their future. So even with all of that history quite literally standing around, there’s really only one type of media that pays any attention to it — and most of those travel blogs aren’t being written by Germans. This entry was posted in Berlin, Culture, German and tagged architecture, Berlin, Germany, History.